The current mental health system is failing children and young people. Whilst in almost all areas of health and care reform the dominant trend is to encourage people to be more independent and resilient, in Child and Adolescent Mental Health Services (CAMHS), something has gone badly wrong. This report argues for reform of the mental health system to provide greater support for the majority of young people who will not receive treatment from specialist CAMHS whilst ensuring that those in desperate need of clinical intervention receive immediate help. There is a current tendency for many young people to not register on the radar when they try to deal with their problems. Instead of receiving sustained support for their mental health, they bounce around different tiers of services without sustained support. Even after being treated for severe mental health difficulties they often again fall off the radar until they reach another crisis. There needs to be a better focus on addressing the challenges that young people face in their mental wellbeing or, as we prefer, mental fitness, rather than solely concentrating on the presence of clinically diagnosable mental health disorders. Such a focus would provide agency for young people to – with the support of the wider community – better develop resilience before the involvement of specialist services whilst ensuring that those with severe mental health needs are provided with immediate specialist support. The first point of contact for young people is often very poor, setting both negative expectations of the quality of support they will receive and their own understanding of the severity of their condition. An estimated 60% of GP referrals to CAMHS are inappropriate and between 21% and 29% of young people referred to CAMHS overall are inappropriately referred. A one size fits all approach means many young people do not wish to access services that still carry a socially unflattering stigma. 22% of appointments in CAMHS were not completed in 2014/15, either through cancellation or not being attended by the child or young person. Despite school-based interventions being both cost effective and proximate to a young person’s everyday life, hardly any Local Transformation Plans are set to commission school-based services. Whilst 75% of local transformation plans mention school-based approaches to mental health, only 40% refer to school-based counselling and only 3% plan to commission these services. Even vulnerable children in the looked after system cannot be sure of an appropriate level of service. Despite it being a statutory duty, many local authorities are not ensuring the completion of the important Strengths and Difficulties Questionnaire designed to assess a young person’s risk of poor mental health. Sixty-two local authorities are currently below the national average completion rate of 75%. 58% of CCG areas are not on course to hit their target of treating 35% of young people who have a clinically diagnosable mental health condition. 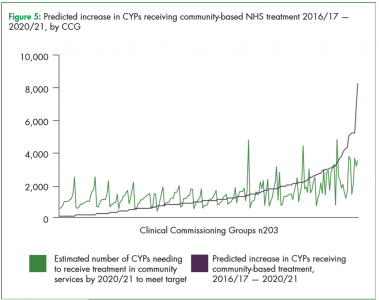 Based on Localis projections, and as illustrated in the graph below, 117 out of 203 CCG areas will not meet this target. Recommendation 1: Following on from recommendations from both the Health Select Committee and the Carter Review, the Department for Education should ensure that a mandatory module on mental health is included in initial teacher training. Recommendation 2: Following from the Prime Minister’s announcement that every secondary school in England will be provided with free mental health training, government should provide guidance on how it plans to roll this out in order to provide clarity for school leaders. Recommendation 4: Through the passing of the Children and Social Work Act 2017, government should use the requirement for governmental approval on any professional training standards that Social Work England establishes to ensure that mental health is incorporated in social work training. 5.1 Providing local authorities with the statutory duty to provide school-based support services for all young people between 11 and 18 who attend state maintained schools. Councils should be allowed to centrally retain up to 6.5% of pupil premium allocations to fund such services. These funds would provide a starting point even for areas that would require additional money from local CCGs to provide such services. Recommendation 6: NHS England should accelerate their investment into 3,000 practice-based mental health therapists, to provide GPs with support and extra confidence in helping young people with mental health needs directly within the GP clinic. This research was supported by an Advisory Panel, whose members are listed below. They may not necessarily agree with every analysis and recommendation made in the report.